Back that personal information up. Before taking off, be sure and back up all the data—including papers, projects, photos, contacts, and anything else you’d like to keep—that you store on your laptop, smartphone, and other devices. There’s a slew of low-cost and even free services available to back your stuff up in the cloud. Give your credit card company the heads-up. It doesn’t hurt to check in with your credit card company and let ’em know about your travel plans. That way they won’t go placing a hold on your account when they see a bunch of charges in an unfamiliar locale. None shall pass. Take the time to install a password on your smartphone, laptop, and any other devices, so that if you lose the device, prying eyes won’t have access to your personal and financial information. Be good to your phone. If you haven’t already, do yourself a solid and invest in a good protective case for your smartphone, something to keep dirt, sand, grime, and water out of the guts of your device. You’ll also want to think about how to best protect your smartphone’s screen, which can take a beating on days of high leisure. Keep track. Enable the find-my-phone feature now (Android: Settings>Security>Android Device Manager and iOS: Settings>iCloud>Find My iPhone). This security feature not only lets you know the geographic location of your smartphone should you misplace it, it can also wipe your personal information off in case it’s stolen. Check your charges. Many of us have heard the advice not to let your credit card out of your sight, but it’s difficult to know if a thief has targeted a machine you use to swipe your card in with a skimmer that can swipe your data. Credit card companies and banks are paying a lot of attention to fraud and new chip-and-PIN technology is making a difference, but it’s important to keep an eye on all charges made to your account to stay on top of it. Ensure you’re insured. 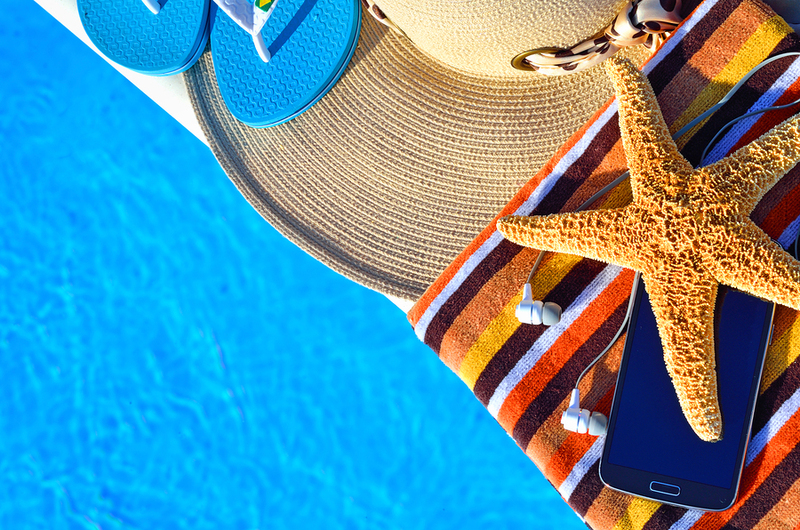 Unfortunately, about one third of travelers usually have to face their device being lost, stolen or damaged while on vacation. It’s not at all difficult to drop your smartphone in the pool while checking email or mistakenly leave it on a restaurant table after lunch with friends. Don’t take your chances. Be sure to secure comprehensive mobile device insurance by contacting your carrier or visit Asurion.com before you leave for your trip. Change your passwords when you get home. Experts recommend that you change your online passwords every three to six months, and coming home from a vacation is a good time to do so, since identity thieves typically sit on your information for a few weeks before seeing what they can get away with. Taking these precautions against mishaps and identity theft will help you keep your spring break all fun, all week long.